Last Sunday I found myself driving along Rexdale Blvd area on my way back to North York from Mississauga. It was at a time that was close to dinner and it would be another 20 minutes to home. As I know I have no energy to fix myself something at home by the time that I come home, I opted to search for somewhere to eat. 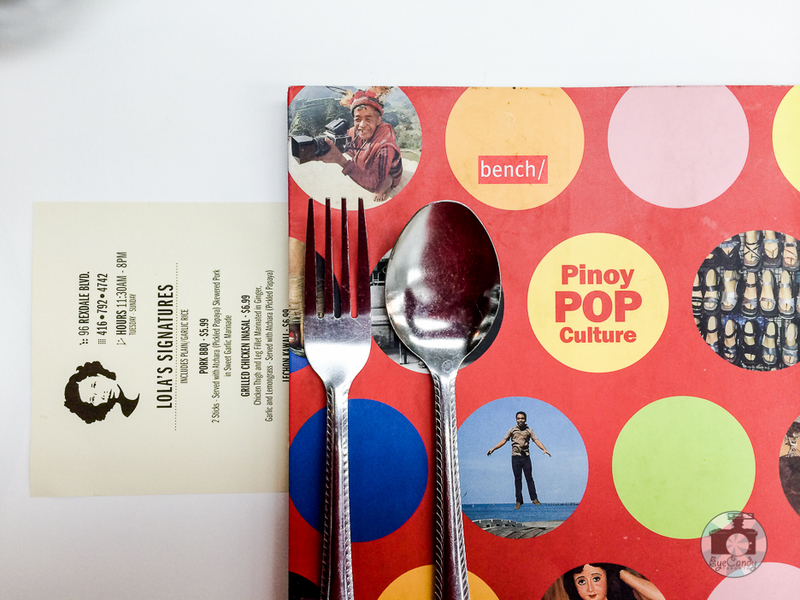 When I used Urbanspoon, one of the places that popped up nearby was Lola’s Kusina. I have tried their food before in Kain Kalye event last summer and I wanted to know more so I decided to walk in. I was pleasantly surprised that the restaurant was airy and spacious. With white walls and big windows, it definitely have that openness that is a definitely plus to any restaurant. There were several tables on site and I took the one closest the window after giddily ordering pancit bihon. Now pancit bihon are rice noodles with sautéed veggies and this is my top comfort food since I was a little kid. This was always my choice as a kid when I am asked what I wanted to eat. As almost every Filipino have their little twists and quirks with this particular Filipino dish, I normally would gauge how good a Filipino restaurant is by the quality of their pancit bihon. And of course, I compare it to mine. And I do cook it very well. Since I tried their pork BBQ skewers at Kain Kalye and it tasted like Manila to me, I had high expectations for the pancit bihon. As I waited, I was wondering if they had their pancit at the back kitchen. And as I watched I realized that they cooked it to order. Now that was commitment to quality. Pancit bihon is best when eaten immediately after cooking. It’s the comforting warmth and aroma of fresh pancit that gets to me. At that point I was praying that the taste would pacify my anticipation. I also ordered a pork BBQ skewer to go with the pancit bihon and it reminded me how the pair used to be main birthday party dishes. I would eat the combo at any instance I can think of. I don’t really need an occasion to consider to have it. Just as like KulturaTO, I love the marinade that made the meat sweet, savoury and moist. It is just the way I remember it to be. Not too long after that, I got my big plate of pancit bihon. It was still steaming as it was placed in front of me, I actually took several forkfuls before I realized I didn’t take a picture of it. LOL. That was how excited I was about this dish. If you noticed, my image is cropped one third of the plate. I tried to make right a wrong that I did. Hehehehe. I must say too that just like what I previously said, fresh off the pan is the best way to experience this dish and Lola’s Kusina staying true to the conventional recipe made my mark. It was such a comfort to me that it is all that I need it to be. An extra topping of fried onions completed the package and I wonder why I never thought of it before.